As a hobby, woodworking for kids is an exciting choice. You can teach children a great deal when they are using their own hand to create an item that they can use. Every step of the process will teach a child a specific task. For example, when measuring out boards, the child will learn about numbers, height, width, and depth, all of which will be useful later. When considering which project will best suit a child, think about their level of matureness, their ability to follow directions, and what actually interests them. Woodworking projects will encourage a child’s creativity. Even if a younger child is simply making a picture frame or a box, allow them to finish it as they want. While it may not look like an award winning design, the child will have something that they created. It really doesn’t matter if they end up painting a small wooden plane with purple polka dots. It’s the process of creating the plane that really matters. Woodworking for kids may end up being a bit boring if the projects are too simple. However, you should also take care not to choose a project that is overly complicated or they will tend to become very frustrated.With younger children, you should choose a project that can be finished in one sitting. Since children have rather short attention spans, they will love seeing the completed project on the same day that they begin making it. 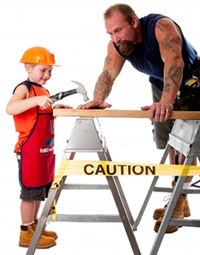 Older children are better suited for projects that will take more than one day in a shop. You may be surprised at how quickly they are ready to return to go to work on it again. I will suggest having a plan or drawing as a starting point and you should be able to get some ideas from these links to a reputable plan provider, coplete with all instructions. Even if you don’t buy any of them, they will give you some good ideas. For the younger child a little bit of education with 1' Tall Letters and Numbers Patterns, using the ones to spell out their name. If you would like time to stand still for a while and I know I did when my boys were small, then 10 Kids' Clock Plans are simple patterns. These wind whirligigs look like fun and are probably made from 1/8th plywood which is relatively cheap to buy. A bit more advanced and seasonal would be "Santa's Helpers" Sign, Plan No. 297 which will encourage the artistic side of the child. Obviously, close supervision is a necessity when you have kids in a woodworking shop. While you want to know what they are doing at all times, it is a good idea to allow the child to work on their own. If they begin to get discouraged, then offer your help. However, allowing the child to work on the project alone will give them a feeling of satisfaction when the project is done. You must remember a child’s safety, first and foremost, though. This is especially true with power tools. Your child must follow safety rules, even if they really don’t want to. Woodworking for kids offers a great opportunity for a child to connect with you. Use your experience as a woodworker to pass your skills along to your children, but also stop and talk or just listen for a minute. Listen to what your child has to say – at any age – and let them know that you value this time together. For many kids, they will love learning and improving their new skills but for others, it’s all about spending time with you. I took my eldest son Mark; he later became a structural engineer, on to site at the age of 8. I had him measuring and fixing perimeter noggins to the underside of the first floor, I did the cutting. His brother Paul worked with me from the age of 16 when we were sub contractors building 56 luxury flats, a retirement home and other projects. Although Paul decided on another career, he had learned precision and his projects at his family home are impeccable. Woodworking for kids certainly helped my kids.